For those of you part of the SEMC you might remember seeing an overflowing box that collects milk bags. It's located in the foyer on the small table. For the last two years a small group of Junior High Students have been meeting on Tuesday evenings. They have cut those bags into strips, then they tie the strips together into long strings of milk bag pieces and then they either weave or crotchet those those long strings into a milk bag mat. It takes hundreds of milk bags to make one mat! As part of our trip this year that Tuesday evening group had about 20 mats for us to take to El Salvador. We left two or three behind, because we were out of luggage space, but the rest made the trip. The intention is that we would give the mats to the families we were building homes for. That way they could put them on their beds (if they had them) or on the floor (if they didn't). Also, this Spring, our IMPACT Youth group did a fundraiser where they received donations for spending a week sleeping on the milk mats. They raised over $2,000, which helps us do the things we are doing here. Turns out, we, our team, are very thankful for the milk mats. Our sleeping accommodations aren't quite the "small hotel" that we've enjoyed on our previous visits. We're all on bunk beds, which have thin metal rails beneath a thin mattress. 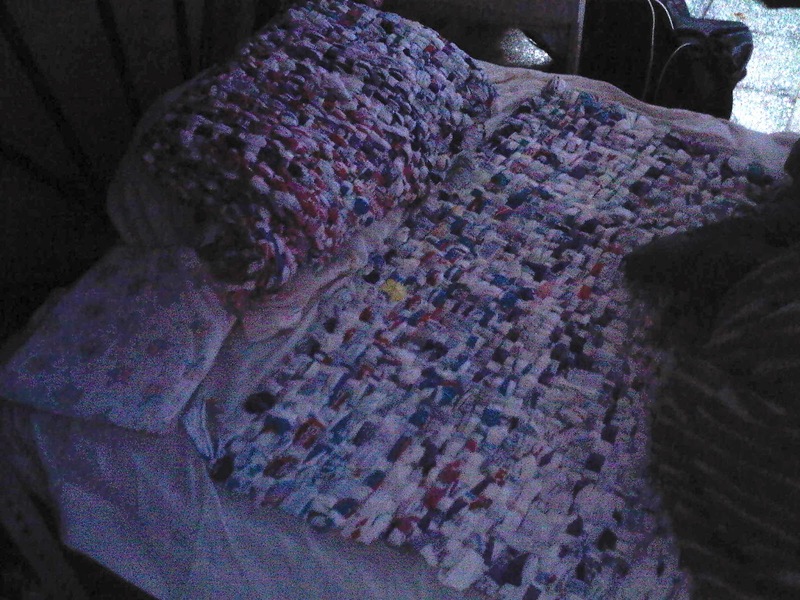 Many of us have put the milk bag mats on our beds to provide added support and comfort. Our beds were also lacking pillows...but, no worries, turns out the milk bag mats also make a functional pillow! Who knew? !...oh yeah...God did!! We'll give the mats away at the end of the week knowing that they do provide comfort! Have a great night! And thanks for your prayer, comments and care for our families at home in Sarnia. I have heard of these mats but did not know anyonewho was making them. Would you like help collecting more milk bags? I live in Guelph and would love to be part of this project by collecting them in our local church.